Apple has released two new versions of iOS 9, both of which are meant for public. Both iOS 9.0.1 and iOS 9.1 beta 2 are available for all supported models of iPhone, iPad and iPod touch. 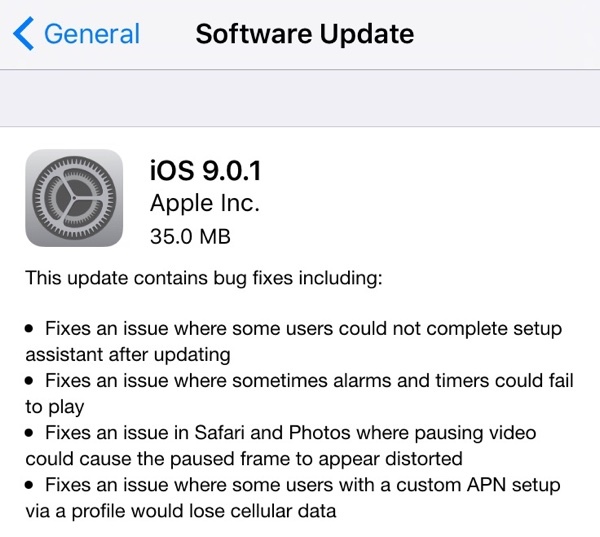 iOS 9.0.1, which was released publicly is the first update of iOS 9 since its original release on September 15th. As expected from a point update like this the operating system version brings minor bug fixes and performance improvements. The update can be downloaded from over-the-air as well as through direct IPSW download links provided below. Alternatively, you can update through iTunes. iOS 9.1 beta 2 on the other hand is targeted towards users who are testing the upcoming software update for the company. If you want to try out the beta you can download the update after registering your device to beta.apple.com. It is also available through over-the-air for users who are already running the beta 1. While 9.1 is mainly meant for iPad Pro, it does bring some features for other devices that includes new emojis, some Siri related features and more. You can find the iOS 9.0.1 direct download links below.